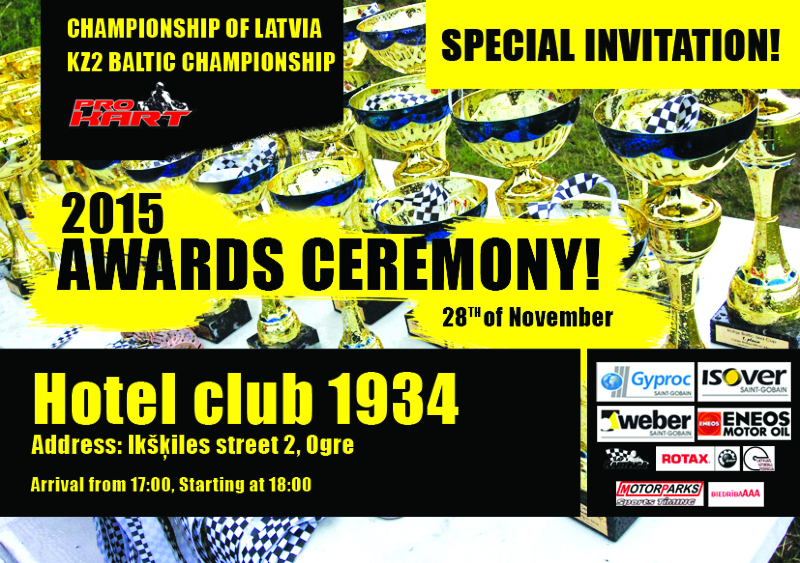 We invite all the karting and minicar season 2015 winners and other interested parties to the awards ceremony on 28th November, which will take place in Ogre, the Ikskiles street 2, Hotel Club 1934. Admission open from 17:00. Official part of the event duration is 18:00-21:00. Evening program consist of Pro-Kart, Latvian Championship, Latvian Rotax Challenge, KZ2 Baltic Championship and Latvian Minicar championship winners Reward. The audience will be entertained by various performances. Afterparty goes on until dawn under DJ rhythms. Free of charge invitation becomes prizewinner and if the prizewinner is under 16 years of age, than also one of his attendant. For all other Guests the entry fee is 20 EUR per person (alcoholic beverages not included). Invitations card can be taken out/ purchased during the general meeting of LAF Karting Commission on 21.11.2015., which will take place at the same place Ogre, the Ikskiles street 2, Hotel Club 1934. Or at any time by contacting Valdis Brutans (+ 371-29532998). <a href="http://xmcnny.com">Uneleallrapd</a> accuracy, unequivocal clarity, and undeniable importance! I'm not exactly sure how to read the gomeenvrnt's position on this Legions soldiers march. If it is like it is in the US, then freedom of speech and peaceable assembly is guaranteed to all.BTW, Russia's "Victory Day" celebrations are seen in a different light by most Eastern European countries. Labs! Erik tev uusas piestaav. Peace visiem kartingistiem! Kad un kur būs pieejamas bildes no foto stūrīša? Vai būs pieejamas bildes no apbalvošanas ceremonijas foto stūrīša?? Kādas izmaiņas gaidāmas tehniskajos noteikumos nakamsezon? Butu labi zinat lai laicigi var tehniku pielagot.